Officer David Sherrard of the Richardson Police Department was killed last Wednesday, Feb. 7, during a stand-off with a gunman. In Westerville, Officers Anthony Morelli and Eric Joering were responding to a 911 call on Saturday, Feb. 10, when they were killed. 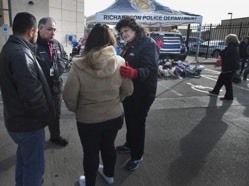 "Law enforcement officers put their lives on the line every day to protect and serve their communities; to protect and serve all of us," said Jack Munday, international director of the Billy Graham Rapid Response Team. "Each of these officers has a family that is left in shock and incalculable suffering, their departments are struggling with anguish of their own—while still having to fulfill their ongoing duty—and the communities at large are mourning. The need for prayer is great." Franklin Graham, president and CEO of the Billy Graham Evangelistic Association, shared, "Our thoughts and prayers are with the families of Officer Anthony Morelli and Officer Eric Joering who were killed in the line of duty just outside of Columbus, Ohio. They were responding to a 911 call. Also pray for the entire Westerville Police Department during this difficult time." Graham continued, "Pray for these heartbroken families, that they would have God's comfort and healing. The Bible tells us, 'The Lord is near to the brokenhearted' (Psalm 34:18)." The Billy Graham Rapid Response Team was developed by Franklin Graham and the Billy Graham Evangelistic Association following the attacks of Sept. 11, 2001. 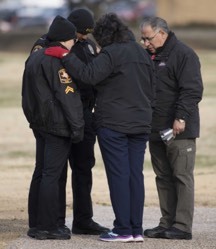 It has since grown into an international network of chaplains in the U.S., U.K., Canada and Australia who are specifically trained to deal with crisis situations. They have deployed to more than 270 disaster sites, including shootings, floods, hurricanes, wildfires and tornadoes.